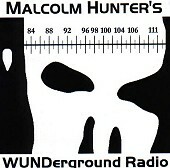 Cheesy electronic rock music, Malcolm Hunter's WUNDerground Radio sounds like bad midi music coupled with live horns and guitars to form a bad synth-rock combo that isn't even up to par with the term 'bar band'. Elements of jazz, funk, rock, and pop play a role in this CD. And as unusual and quirky as it is, there just isn't anything good here. As far as music goes, calling this material demo quality is being nice. It just isn't consumer friendly... yeah, consumer friendly, yet. I'll give it an F.